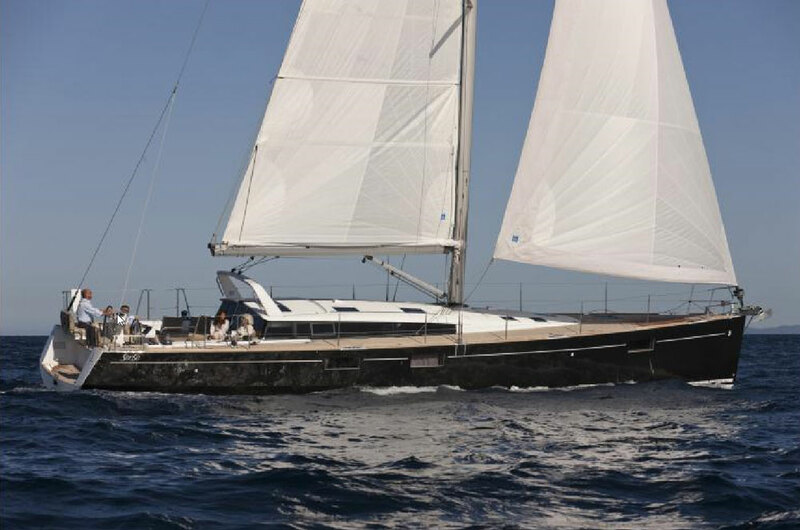 A change-up on a game-changing cruising sailboat. 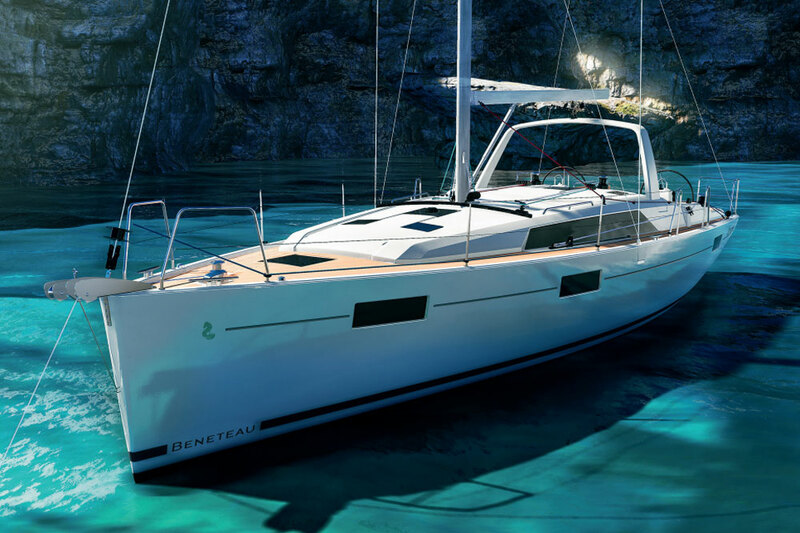 Evaluating an existing sailboat model that’s been changed up to reflect owner feedback can be interesting, which is why we were curious about the re-launch of the entire Beneteau Sense line that was introduced in 2010. Originally, the offering had four models from 43-55 feet. And in the 2016-2017 revamp, the Sense 50 morphed into the new Sense 51. Join us for a brief look at the boat on video. When introduced, the Sense was dubbed a “monomaran” for its enormous cockpit and wide transom. 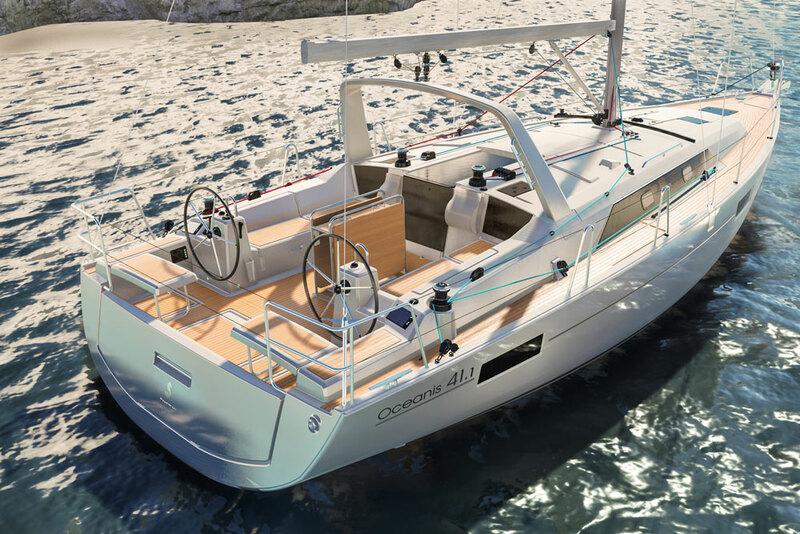 This melding of monohull and catamaran attitudes produced an open aft end with only two helm seats, which could be lifted up and out of the way. The idea had appeal at the dock but owner feedback showed concern about safety, especially for pets or small children that could take a tumble out the back. Hearing this, Beneteau introduced a drop down transom that serves a dual purpose: First, it contains the cockpit with a hard barrier and second, it creates a place to stand when cooking in the newly introduced galley. Nestled inside the added fixed helm seats (that hinge up) is a two-part galley. To starboard is an electric Eno grill and to port is a sink and prep station. I’m not sure why a sailboat has an electric grill rather than propane but most owners will likely spec a genset so it’s workable. Due to its proximity to the cockpit social area, this galley keeps the chef in the party even during meal preparation—and keeps cooking heat and smells out of the interior. An added bonus is two stowage compartments below the helm seats for fenders, dock lines or water toys. A redesign of the cockpit area is one of the most notable changes you’ll find on the Sense 51. A step leads up to the working part of the cockpit with liferaft stowage below the sole and twin helm stations outboard. The command consoles are wide with nicely integrated stainless-steel grab rails, compasses, and 12-inch B&G instruments/MFDs. Controls for a bow thruster and remote windlass with a chain counter may be added to the starboard helm, where you’ll also find the throttle. Visibility forward from the helms is excellent and the primary winches are within reasonable reach of the driver, although the option of electric winches will make sheeting in much easier. Secondary Harken winches and arrays of rope clutches are on the cockpit coaming farther forward. There are also built-in sheet boxes, although they may not be large enough to hold the mess of halyards and sheets that will end up there. Also reworked is the companionway door. Instead of the prior electric system that stowed the hatch down inside the hull, the door is now a three-panel folding acrylic structure that opens out. It’s nicely designed and also less prone to mechanical failure, which long distance cruisers will appreciate. After all, Murphy’s Law dictates that hatches are almost always going to get stuck open, and then what will you do? Another excellent addition was the Bimini, also called the “SmarTop”. It’s combination of a hardtop and soft middle that slides open like an accordion sunroof. Two features make it an especially attractive option: First, it’s supported by a sturdy stainless-steel structure that makes great handholds. Also, it’s angled inward at the aft corners, providing space for crew to stand and toss a line onto the dock. This will be especially useful in Med-mooring situations. The new composite structure extends back from the arch and out to just above the winches and has stainless-steel grab rails all around. Surprisingly, the hardtop doesn’t really add much height to the vessel’s profile and flows aft nicely. Berret-Racoupeau’s original sail plan is still present. A Selden rig with double spreaders with a split backstay and a rigid boomvang supports over 1,300 square feet of sail area. The arch over the companionway secures the mainsheet, allowing for efficient end-boom sheeting. The headsail is on a Facnor furler, which is attached to the newly integrated sprit. This appendage can now hold twin anchors and serve as an attachment point for a Code 0. It blends nicely with the hull but it adds a couple of feet to the overall length, so plan your slip accordingly. The decks are wide and clear with 15 flush hatches and deep anchor locker forward that will allow for a straight fall of the chain from the electric windlass. All control lines are led aft to the cockpit via tunnels, which eliminate clutter and tripping hazards, and the bow, stern and mid-ship cleats are tall enough to accommodate thick dock lines. From the sleek light-displacement hull and low coachroof with angular windows, to the slippery underbody with a spade rudder and choice of keel drafts (6’ 1” or 7’ 3”), this boat benefits from its aggressive styling. The high lifelines are especially good to see on a serious cruiser. The Sense interior was revolutionary when introduced. The concept created open spaces that didn’t feel buried in the hull and the quiet cabins were moved away from onboard machinery mostly situated under the cockpit sole. That much hasn’t changed. The cabins are still clustered forward and are less separate (and therefore less private) than on a yacht with a traditional layout, which some will appreciate while others won’t. Like the 50, the 51 offers two cabins and heads with a third room that can be either an over/under bunk cabin or an office. Three steps angled at 45 degrees lead down to the saloon, from which you can see out via the hull ports even when seated. The interior finishes have been changed up throughout. 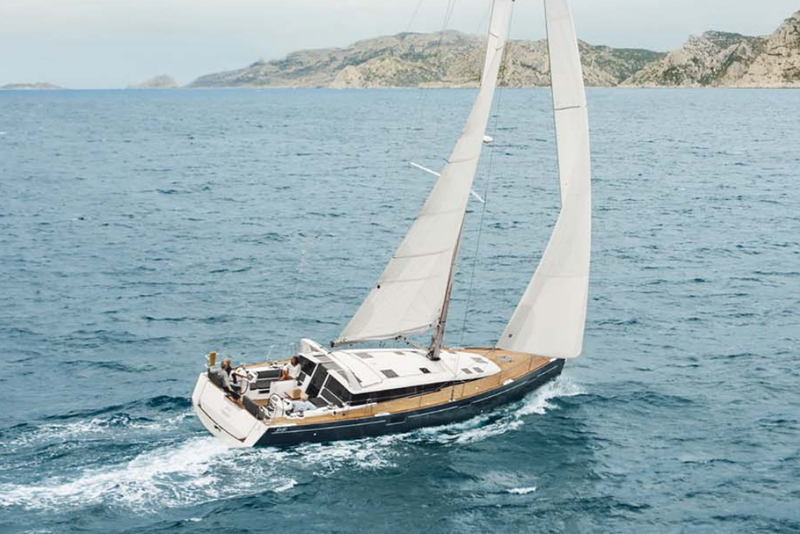 Beneteau added a new, richer Alpi walnut color of wood with a deeper tone to the trim paint. The cabinetry is better finished at the edges and the locker faces can now be either lacquered finishes or a continuation of the wood grain. 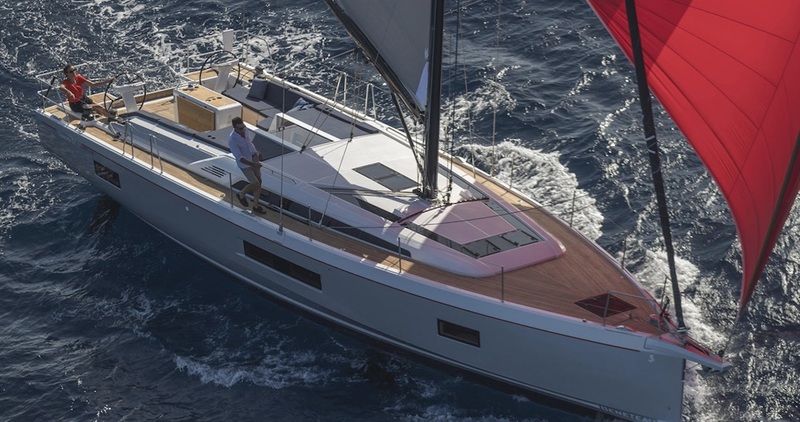 As with all their designs over 50 feet, Beneteau is focusing on luxury touches in the Sense 51 and it has made a noticeable difference. 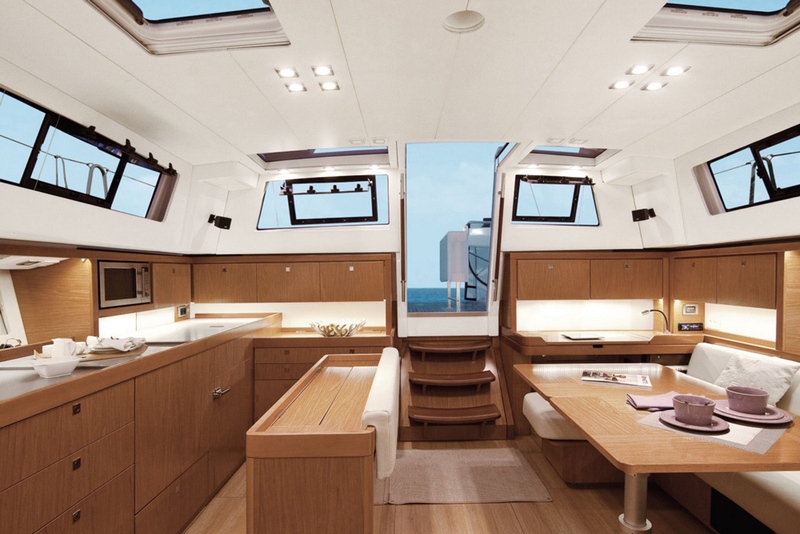 While the finish inside the Beneteau Sense 51 cabin is different, the general design and style are similar to that of the 50. Our test day had fluky winds but at 11 knots of apparent wind at 60 degrees off the bow, our test boat made 7.5 knots of boat speed. As we hardened up to 45 degrees apparent, we slowed slightly to 6.6 knots and then picked up again to 8.3 knots on a beam reach. The boat has a sturdy and steadfast feel and will inspire confidence even in couples who cruise shorthanded. Under power, the 80 HP Yanmar diesel with a Saildrive delivered 9.1 knots at 3200 rpm and settled nicely into a cruising speed of 8.5 knots at 2400 rpm. Having the throttle up high near the starboard console rather than down by your knees is helpful, especially when docking, letting you keep your eyes on what’s ahead. With 110 gallons of fuel and 151 gallons of water (extra fuel and water tanks may be added for roughly two hundred gallons of each), the Sense 51 is a go-far boat. Options seem to be priced in $13,000 increments. If you want to add the SmarTop, it’s $13,000. Need a watermaker? It’s $13,000. That’s an over simplification because a bow thruster will add $8,000 and the Code 0 around $10,000. Once you tally up all the goodies like electronics and composite wheels, the 51 is likely to come in around significantly higher than the published (at the time of this printing) $428,000 base price. But for that, your reward will be a comprehensive vessel whose evolution has made it smarter, safer and better in every way. 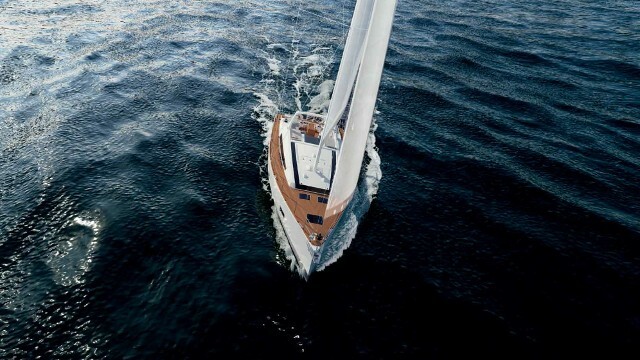 Other Choices: Sailors who want a more traditional cabin layout should see the Grand Soleil 50. 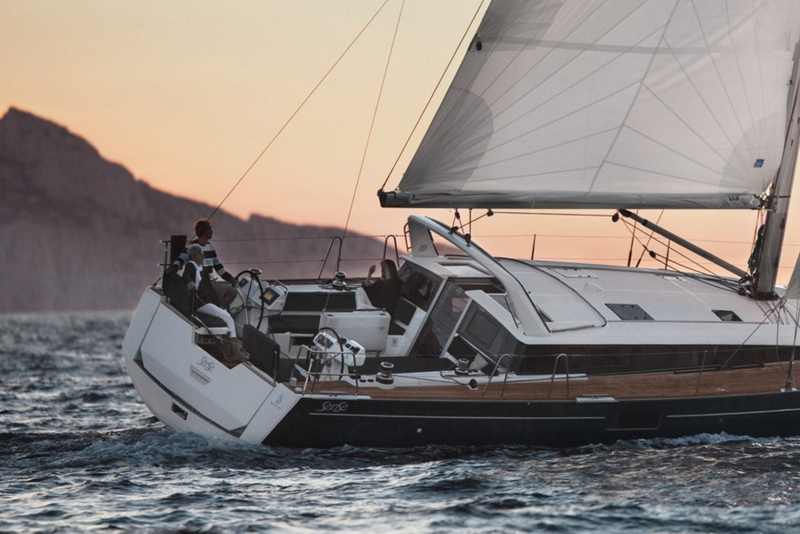 Two other options to check out would include the Hanse 505, and the Jeanneau Sun Odyssey 509. 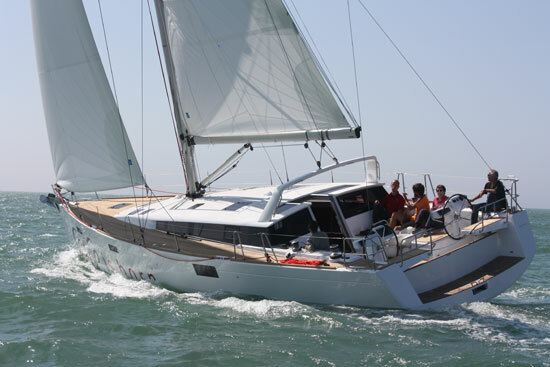 See Beneteau Sense 51 listings. Sail area 1,300+ sq. ft.